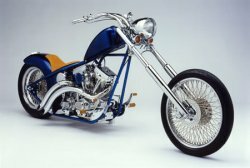 Chopper Design Services, established in 1999, has been building sweet custom bikes and servicing everything else since this time. Located in Longwood Florida, we have the experience and resources to help you with whatever you need for your American Motorcycle. 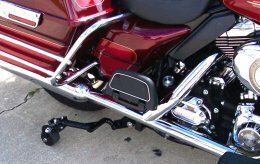 We discount all our parts, we service Harley-Davidson bikes for about half of what a dealer does, and you get your bike back CLEAN! For the last 5 years, we have been developing and manufacturing a Motorcycle Stabilization System called 'LegUp LandinGear'. This computerized system has helped us keep the doors open during these trying times! For folks who need just a little help with their heavy bikes, this is the ticket! Click here for some more info on the `LegUp System'. Our signature bike can bee seen above on the left. While the bike building and custom bike business has fallen on hard times, we can and still DO make folks rides into whatever it is they dream them to be! Our project pages above, document many past projects or check out the "Blue Diamond", featured in September 2001 EasyRiders magazine. We document every step of a ground-up build. We all see these beautiful motorcycles, but how many of us see what it takes to go from concept to cruising? Check out our VIDEOS page to see some of our most recent projects, or our Projects page for some legacy projects! Lovin two wheels and helping others to do the same. If you feel this way as well, Give us a call at 407-834-5007!